Three local authors have recently released books, just in time for the holiday season! His third book, Paul Jensen has researched the history and characters who lived along Horse Creek near Daniel, Wyoming. Chapters include the origin of the Horse Creek name, Benjamin Bonneville and Fort Nonsense, Dr. John Montrose, the tie hacks, early homesteaders, infamous and novel men, George Harley, William "Pops" Snider, Andre "Frenchie" Germain, Harve Scott, Patrick Conwell, Austin Richardson, Clarence Webb, Gordon Jewett, Ed Todd, Diane Boroff and Bob Beard. Other items covered includes the Mill Creek Tie Hack Camp, Sherman Guard Station, Merna Schoolhouse, Merna Store and Bar, Lew Binning’s homestead, Irwin homestead, Thomas Odle’s homestead. Proceeds from the sale of the book go to the Daniel Community Center. 191 pages, soft-cover. 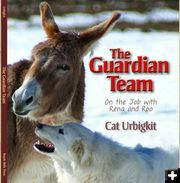 Cat's latest children's book, The Guardian Team: On the Job with Rena and Roo, follows two very different creatures--a dog and a burro, who work on the Urbigkit family ranch as livestock guardian animals. Roo is an orphaned wild burro taken in by Cat and her husband; Rena is the runt of the recent litter of Akbash puppies. Through heartwarming text and gorgeous photographs, the book chronicles their lives as the two overcome their fear of each other and differences to share the same goal, to protect their herd of sheep out on the Urbigkit ranch in western Wyoming. All three books are available locally at the Cowboy Shop (www.cowboyshop.com) and Office Outlet (307-367-6763) in Pinedale, Office Outlet in Big Piney (307-276-5250), and online book dealers.